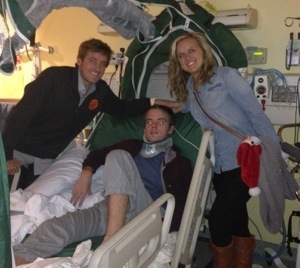 The nurses put Jake in a wheel chair with a seat belt to keep him in it. He reached down and undid the seat belt so he could get out. Thatta boy. I told him to keep it up. He’s not your average head injury patient. Always ahead of the curve – in all aspects of life. Jake is so nice it’s incredible. His room is full of all his friends and family. Amber brought Christmas tree lights and a giant stalking for him. Amber asked if he wanted us to leave since he’s tired. He said “yea, but it’s ok”. The nurses were poking him with a needle earlier and he said “ouch”. They apologized and he said it was OK in a very sweet voice. This new hospital is MASSIVE! It takes about 10 minutes to get from the car to his room. But they are ON IT, let me tell you. Mom said they do an amazing job and I can tell. They’re very nice. I asked about the Alpha Brain today because the last hospital said they’d be sending it with him to be taken here. The nurse talked to the doctor and he’ll be starting it again tomorrow.